The birth of your child is a big deal. Such a big deal that lots of your family members, friends and co-workers come to visit you before, during and after the monumental event. And not only do these people come to congratulate you, coo over your precious newborn and converse, they take pictures. Lots of pictures. Pictures that end up in photo albums and text messages and social media platforms for the world to see. While no new mommy is expected to look perfect head to toe (there’s something so beautiful about that post-birthing glow and mess of hair that accompanies it), it’s no surprise that many women wish to present themselves in a more “fashionable” and “polished” manner at the hospital. Mary Apple, a mother of two, designed what she calls “PrettyPushers.” They’re essentially birthing dresses that are comfortable, pretty and more style-minded compared to the unisex hospital gown you get when checking in. She says they’re meant to be worn either at the hospital or at home when a woman is giving birth and are designed to be flattering and feminine, but still functional thanks to the thoughtfully placed medical access points. A great place to start, says Apple, is with what women wear in the delivery room. She’s not the only one who feels that way, either. 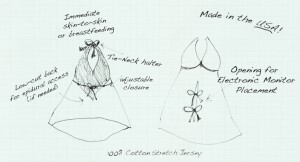 BG Birthing Gowns also offers some birthing dress options. Theirs feature a wrap-dress style that fits a variety of figures and provides full coverage so you’re comfortable and covered. Their motto, printed boldly on their home page, reads, “It is time to give women what they want!” and goes on to say that their dresses give women the confidence to be actively involved in the birthing process. Even if you poke around Pinterest on labor and delivery boards, you’ll see lots of pictures of women who’ve just given birth (or are actually giving birth in the photos!) who look stylish and put together. When it comes to delivery room style, it’s not all about the clothes. Across the nation, pregnant women with approaching due dates are hitting up nail salons, hairstylists and even waxing specialists in preparation of their birth. Of course, it’s easier to plan ahead if you have a scheduled birth, such as a C-section or an inducing appointment. But even women who begin experiencing early contractions take the time to shower, shave and apply makeup before heading to the hospital. Others yet take their pre-delivery room primping one step further by scheduling facials, “down there” waxes, haircuts, manicures and pedicures the week leading up to their due date. All in an effort to not just look beautiful, but to feel beautiful. Do you think you’d undergo a little pre-birth primping? And do you plan to wear something besides the unisex hospital gown you’re handed? Whether you’ve already giving birth or are approaching your due date, we want to hear your thoughts on this topic! Share in the comment section below.